In the southern part of Germany, there are numerous climbing areas scattered around near the Alps. In the region of Chiemgau while crossing over the motorway towards Salzburg, you might have seen the silhouettes of the Kampenwand peaks on the right side protruding up in the sky. 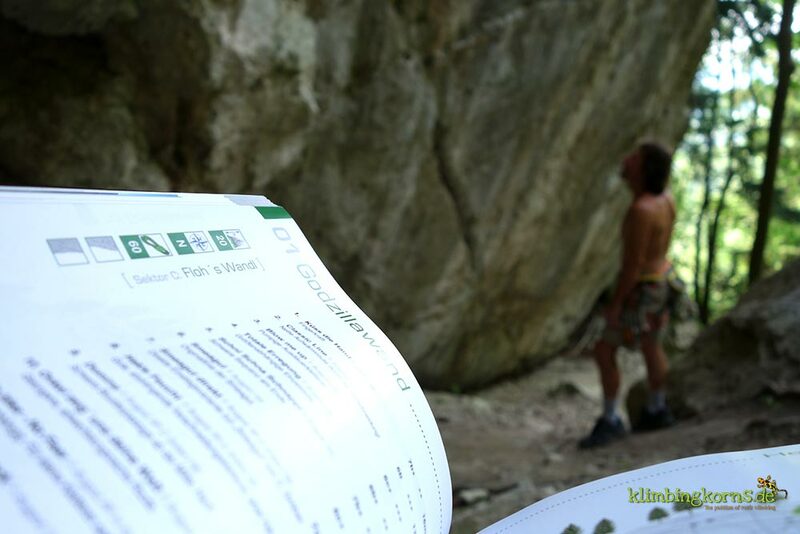 The climbing guidebook Chiemgau Rock describes the most important climbing areas between the Inntal and Berchtesgaden, which is a part of the Northern Limestone Alps. 26 different crags bundled in a book with 450 pages brings you to some of the best venues of this region. Many interesting summer walls are packed in the guide-book. Some of them has to be combined with a much longer hike up the hills – certainly a test piece for lazy-to-walk-sport-climbers, spoilt by close access’ that had no longer than 10 minutes. I was actually just about to stamp and retitle the book up as a summertime bible, but I recently found myself climbing at one of these places at the end of a hot November. The Pleitewandl is good all year round, except for the real winter months in December – February (yes, I’m still waiting for the Palm trees to grow). The hottest sector is the Wasserspiele, due to its exposed south sided face, perched on a terrace. A few trees might cause some complains. There are numerous routes in the 6th grade, perfectly bolted from the ground off. With the extension of many first pitches, some of the routes goes up to 35m like e.g Pfeifei 7a, in just one climb (70m rope and knot obligatory!) No wonder, they show signs of popularity. The more ambitioned climbers can stay at the bottom where Sector Pleitegeier holds many overhanging routes from UIAA 9 to 11 compressed in just 14 m! The upper sectors right of these walls has some good routes too, and are good for summer days. The Zellerwand, located deep in the Chiemgau Region, comes with more than 218 routes and about 12 sectors . Moderate climbs in the 6th grade makes this place popular on days when conditions are good. There are steep and overhanging walls too, making it possible for those climbing 8s and 9s interesting. On sunny and dry winter days, it’s possible to climb here, even though it isn’t as sunny as some of the spots in the nearby Tirol. However, watch out on the access in winter – it can be terribly slippery and icy. Crags like Bergen or the Pointner Graben are all within a 30-50 minutes walk up. If you’re a keen mountain biker, you could cut short the access and make the return a whizz. They are both great destinations during the summer especially after a longer period of dry. Both areas are north sided, and the Pointner Graben is a little better protected during rainy periods but seeps after heavy showers. Routes go from UIAA 6- 10 and there’s a fair amount to keep you coming again and again. In Pointner Graben, the grades feels really stiff and the climbing is more technical but awesome. Whenever you pass by the Inntal motorway, you might have noticed the Heuberg mountains on the left. A few sectors are hidden right next to the big stone quarry with a few really nice climbs hidden in the forest. Problems with the local hunter and the quarry makes coming here not always fun, especially to the Weigand Wall. (at the moment, it is actually better to refrain from climbing there completely) Sectors like the Godzilla Wand or Rock City, which lays further away from the quarry are for now the safer choice. However, the grades starts from UIAA 8, with just a few 7s to barely warm up on. Karlstein is the classic area around the Berchtesgaden region. It’s been around for many years and has been the local playground for the Huberbuam (Huber brothers). There are many sectors to choose from, with grades ranging fom UIAA 5 to 11. Sector Drugwall is perfect to check if your hard training has paid off. Many of the routes were bolted by the Huber brothers. Every now and then you might see one of them climbing there. Well, that was before they expanded off to new exciting places everywhere else. Newer areas like Monkey Heaven or Schneitzlreuth, which is just around the corner, is a summer spot with a quick access. There’s really still plenty of walls that we have yet to see and so much has been developing of late. With the guidebook, I can finally put bits and pieces of paper topos away. 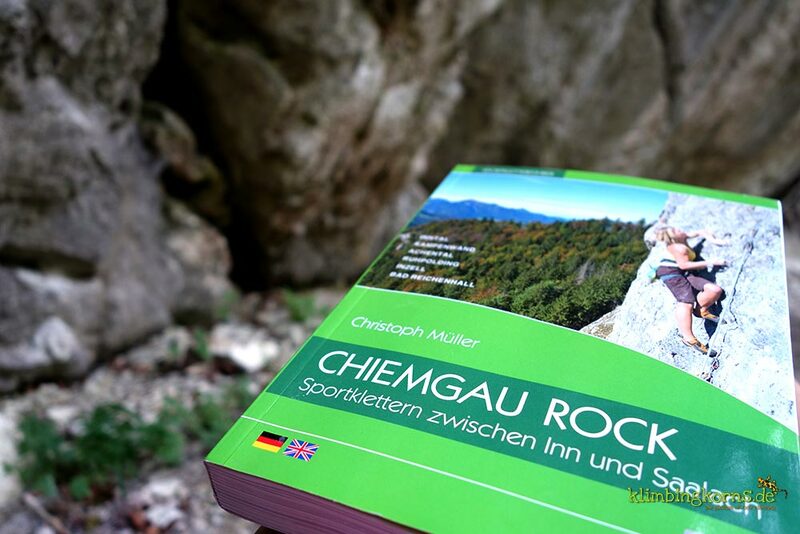 The guidebook Chiemgau Rock comes in 2 languages – German and English. That is certainly a plus point for international visitors looking to climb in this region. The topos are clearly drawn, and each route described in detail and rated in its beauty. Even though many might think of publishing the name of the route developer and the date when it was first bolted as unimportant, I found that it gives you a big idea what style of climbing and bolting awaits you. Little icons to the right shows which type of bolts are used . GPS Points are a great help to get you quick to the parking lot, not always something you would find in many other guide books. Hats off to the author, Christoph Müller who has done a good job in putting all these information together.